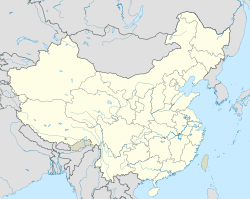 Shangqiu (Chinese: 商丘), formerly romanized as Shangkiu, is a city in eastern Henan province, Central China. It borders Kaifeng to the northwest, Zhoukou to the southwest, and the provinces of Shandong and Anhui to the northeast and southeast respectively. An ancient city with a rich history, Shangqiu was also the first capital of the Shang dynasty. Its population was 7,362,975 inhabitants at the 2010 census whom 1,536,392 lived in the built-up (or metro) area made up of Liangyuan and Suiyang districts. Once merely a small village, Shangqiu has grown significantly in recent years. It is important geographically because it lies at a junction of several major railways, making its train station a major regional transportation hub. The history of Shangqiu is closely related to the very beginning of Chinese history. Tradition dates back to the Three August Ones and Five Emperors periods (c. 25th century BC), when the semi-legendary Emperors Shennong, Zhuanxu and Ku were said to be living in the present Shangqiu area. The son of Emperor Ku, Qi (契), who helped Yu the Great to control floods, was enfeoffed the area of Shang (which is the current day Shangqiu area), who also became the ancestor of the ancient nationality of Shang. It is said that the Shang people first started trading with neighboring countries by shipping the goods with ox wagons. Since then, people doing business are called Shang people (Shāngrén 商人, means businessman), which is still the case now, although people are not likely to know the origin of the words. Shangqiu was also reportedly one of the capitals defended by the Xia emperor Xiang, troubled by rebellions in his reign. The thirteenth generation grandson of Qi (契), Tang overthrew the ruling Xia Dynasty and founded the Shang Dynasty, with its first capital at Nanbo (南亳, currently south of Shangqiu). Around the 11th century BC, the Shang Dynasty was replaced by the Zhou Dynasty. The royal descendants of Shang Dynasty were enfeoffed the area of Shangqiu, which later became the state of Song. The city was the southern capital of the Northern Song dynasty under the name Nanjing. Shangqiu was the first in a series of temporary capitals that the Song Dynasty government moved to during their retreat from the north, when most of northern China had been conquered by the Jurchens in the Jin–Song wars. The Song court had retreated south to the city from their original capital in Kaifeng, after it was captured by the Jurchens in the Jingkang Incident of 1127. The court moved to Shangqiu because of its historical importance to Emperor Taizu of Song, the founder of the dynasty, who had previously served in the city as a military governor. The symbolism of the city was meant to secure the political legitimacy of the new Emperor Gaozong, who was crowned emperor of China in Shangqiu on June 12, 1127. The capital was again moved in 1128 to Yangzhou, and finally to Hangzhou in 1129. Under the Republic, Shangqiu was considered a key city in eastern Henan owing to its position along the Lunghai (now Longhai) Railway between the port of Haizhou on the East China Sea and Lanzhou in central China. It was known at the time as Kweiteh, Kwei-teh, or Kuei-te (Chinese: t 歸德, s 归德, p Guīdé) and had both a Catholic diocese and an Anglican mission, the later of which ran St Paul's Hospital. It changed hands frequently during the fighting among the Chinese warlords in 1927. Shangqiu is the easternmost prefecture of Henan province. Its administrative area ranges in longitude from 114 °49′ E to 116° 39′ E and in latitude from 33° 43′ N to 34° 52′ N, covering 10,704 square kilometres (4,133 sq mi). The city lies on the North China Plain and is mostly flat, with elevations ranging from 30 to 70 metres (98 to 230 ft), though the northwest part of the prefecture is more elevated than the southeast. Shangqiu has a monsoon-influenced humid subtropical climate (Köppen Cwa), with four distinct seasons. Winters are cool and mostly dry while summers are hot and humid; spring is warm and sees some, but not much rainfall, while autumn weather is crisp and drier. The monthly 24-hour average temperature ranges from around the freezing mark in January to 26.9 °C (80.4 °F) in July, while the annual mean is 14.10 °C (57.4 °F). Close to two-thirds of the annual precipitation occurs from June to September. The government of Shangqiu is responsible for the making and implementing of local policies. Since agriculture is still a major part of the economy of Shangqiu, many of the work is related to farmers and the development of the rural area. It is also observed that the government is exerting more and more efforts to attract foreign investment to spur local development. The current mayor is Tao Minglun. According to the 2010 Census, Shangqiu has a population of 7,362,472. That is 390,528 inhabitants less than in 2000 (the population shrank 5.04% in ten years). The prefecture-level city of Shangqiu administers 2 districts, 1 county-level city and 6 counties. The information here presented uses the metric system and data from 2010 National Population Census. Shangqiu is traditionally a centre of the indigenous Chinese religious cult of Huoshen (火神 "Fire God"). An ancient small Temple of the Fire God has been expanded throughout the 2010s to become possibly the biggest temple complex dedicated to the god in China. Moreover, Shangqiu traditionally hosted the headquarters of Liguaism (Li Symbol transmission), the most important denomination of Baguadao. Situated on the North China Plain, Shangqiu is part of a traditionally agricultural region. The fertile soil and convenient irrigation facilities greatly help the production of crops and other plants. As of 2005, there are about 719,864 hectare planted. The most important agricultural products are wheat, maize, cotton, sesame, vegetables, fruit, tobacco, and livestock. In 2002, it produced about 4.5 million tons of crops, 200 thousand tons of cotton, 1.1 million tons of fruits, and 550 thousand tons of livestock. Compared with the agriculture, the industry of Shangqiu is relatively less developed. However, since the 1990s, it has experienced rapid growth. The food producing and packing company, Kedi group, has already been the number one exporter of frozen vegetables in the country. The large reserves of coal in Shangqiu (the Yongcheng-Xiayi coal mine is estimated to have a total reserves of 10 billion tons) also boosts up the energy industry, such as electricity generation and aluminium electrolysis. Since the completion of east-west running Longhai railway in 1916, Shangqiu has been a local transportation center. This standing is greatly enhanced following the construction of the Beijing-Kowloon (Hong Kong) railway in 1996, which crosses with Longhai railway at Shangqiu. Nowadays, Longhai railway has become the Chinese segment of the larger "European-Asia continental landbridge," which runs from the sea port city Lianyungang to Rotterdam, the Netherlands. Shangqiu thus obtains the name of the city of the "golden cross." On the other hand, the road transport is also convenient and getting even better. The east-west direction Lianyungang-Khorghas (Xinjiang) national route 310 and north-south Beijing-Zhuhai national routh 105 also cross at Shangqiu. Highway traffic is fast-developing too. The Shangqiu-Kaifeng segment of the Lianyungang-Khorghas highway is already in use. Future planning for highway construction is also underway. Shangqiu-Hefei-Hangzhou High-speed Railway is under construction , will begin operation in late 2020. The education sector of Shangqiu is mainly professional training oriented, with an increasing number of such colleges coming into sight ever since the 1990s. Lying in the heart of the North China Plain, Shangqiu benefits from a deep cultural tradition. The first star observatory in China, Ebo Tai, was established in Shangqiu. Yingtian Shuyuan, one of the largest four official education agencies in north Song Dynasty, is located in the Suiyang district of Shangqiu. The Suiyang old city, which was built in 1511 during the Ming Dynasty, is one of the best preserved traditional cities in China, and was enlisted as one of the famous historical cities in China by the central government in 1986. The rich culture also raised many famous cultural figures. Cangjie (Cāng Jíe 仓颉), the legendary inventor of Chinese characters, was living in Shangqiu in the far-ancient periods. Zhuangzi (Zhuāng Zǐ 庄子), the great ancient philosopher of China, was born here around the 4th century BC. Another great philosopher, Mozi (Mò Zǐ 墨子), living in the same period as Zhuangzi, was also a Shangqiu native. The famous woman warrior, Hua Mulan (Huā Mùlán 花木兰), was also among the great figures of Shangqiu. Shangqiu is also a Roman Catholic diocese. Dazhouzhuang village, the hometown of the heroine Hua Mulan, lies about 55 km (34 mi) southeast of Shangqiu city. The village contains a temple dedicated to Mulan, and many nearby businesses use her name as a local trademark. According to the history, the ancestral ancestor of the merchants (xiè) was able to control the water, seal the business, and then migrate. Later generations said that the ruins of the merchants had lived in the "Shangqiu". ^ Theobald, Ulrich. China Knowledge. "Chinese History - Song Dynasty 宋 (960-1279): Map and Geography". Accessed 19 Oct 2012. ^ a b Franke, Herbert (1994). Denis C. Twitchett; Herbert Franke; John King Fairbank (eds.). The Cambridge History of China: Volume 6, Alien Regimes and Border States, 710–1368. Cambridge University Press. pp. 229–230. ISBN 978-0-521-24331-5. ^ a b c Mote, Frederick W. (2003). Imperial China: 900–1800. Harvard University Press. pp. 292–293. ISBN 978-0-674-01212-7. ^ Manchuria, Vol. III, p. 436. 1938. ^ a b Rotunda, Vols. XXXVI–XXXIX, p. 37. Royal Ontario Museum, 2003. ^ Christensen, Erleen. In War and Famine: Missionaries in China's Honan Province in the 1940s, p. 77. McGill-Queen's University Press (Kingston), 2005. ^ Administrative divisions of China Administrative divisions of Shangqiu. ^ Shanqiu daily Overview of Shangqiu.